3 ways Human Appeal has provided emergency relief all over the world - Moneyhome.co.uk - The Best Moneysaving Blog ever! Humanitarian aid charity Human Appeal UK is involved in a wide range of projects around the world that are helping to save and transform lives. Here, we take a look at three of the ways in which the Greater Manchester-based non-profit is providing emergency relief internationally. The ongoing crisis in Syria has left the country in a state of turmoil. As well as suffering ongoing violence, high levels of displacement and a shortage of food, its people are having to cope with a severe lack of adequate healthcare services. Human Appeal is helping to address this problem by heading a number of projects, including initiatives designed to provide medical assistance to some of the most vulnerable. For over two years, it has been supporting the Al Imaan hospital in Western rural Aleppo, which specialises in treating women and children. Continuing airstrikes in the region made it too difficult to keep this medical centre open in its original position in Big Orem, so Human Appeal relocated it to a building nearly 40 kilometres away in Qah, Idlib. It has also set up a primary healthcare centre and created a mobile clinic providing services in a number of regions of Western rural Aleppo. Nearly three million people in Iraq are currently identified as food insecure. Playing an important role in providing food to those in need, Human Appeal is involved in the delivery of life-saving assistance to various areas of Mosul city. This includes providing agricultural assets and food to vulnerable families. The charity was one of the first NGOs to start working inside the hard-to-reach parts of Mosul city, including the neighbourhoods of Al-Zahraa and AL-Tahrir. 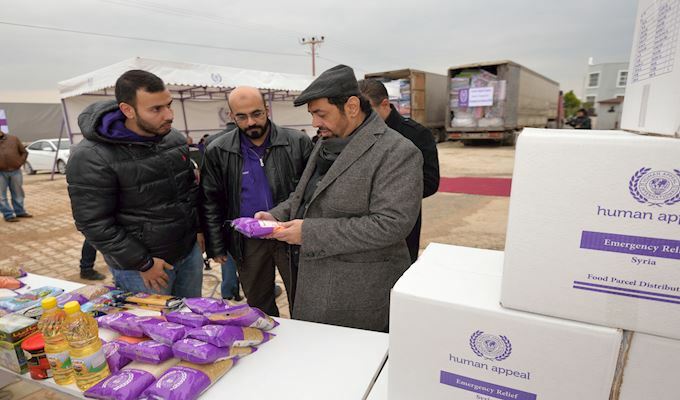 Over a period of just two days, Human Appeal gave 51 tonnes of flour to over 1,000 families. The poorest country in the Middle East and suffering from a deadly combination of instability, widespread poverty, a faltering economy and a severely damaged infrastructure, Yemen is in a desperate situation. Over 14 million of its people are experiencing food insecurity and a similar number lack proper access to sanitation facilities and clean water. As part of its strategy in Yemen, Human Appeal has distributed food baskets to nearly 500 families in the city of Sana’a. It is also providing supplies to the Aljumihori public hospital, including vital medical equipment, a solar energy system and emergency room provisions. These are just a few of the essential projects the charity is involved in across the world. If you would like to find out more about the work it is doing, or get information on upcoming Human Appeal events, you can visit the organisation’s website.